Chanel lovers, you’re in for a real treat this April! For a limited time only, between 8 – 16 April, beauty meets leisure at Chanel’s Coco Café, the latest spark of brilliance to come from the luxury French fashion house. A pop-up concept at the Visual Arts Centre, Chanel’s Coco Café is a Parisian style café where you can enjoy beauty, bubbles and dessert specially curated by Chanel. 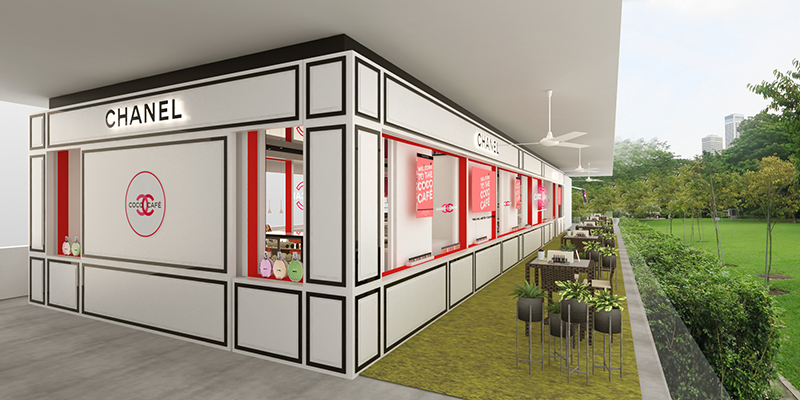 Take in the laid-back atmosphere of Coco Café amidst Dhoby Ghaut Green’s lush surroundings, while enjoying full access to all 27 shades of Chanel’s latest Rouge Coco Gloss collection. You’ll also get to play around with their upcoming Cruise makeup collection, Les Indispensables De L’été, which will be exclusively pre-launched here! Be one of the very first to experience it all by registering here. Not only will you get priority entry, you’ll also receive a complimentary drink and beauty tips from their in-house beauty consultants.